Extracted from Reflections on Engineering 'aha' Moments in Number by Nicholas Dale which is stored in Mathematics Centre Research & Stories. I have developed a school wide mathematics proforma that incorporates Threading activities from Calculating Changes. This ensures that teachers continue to plan these rich mathematical programs each day. Students have been more focused, engaged and interested in mathematics. 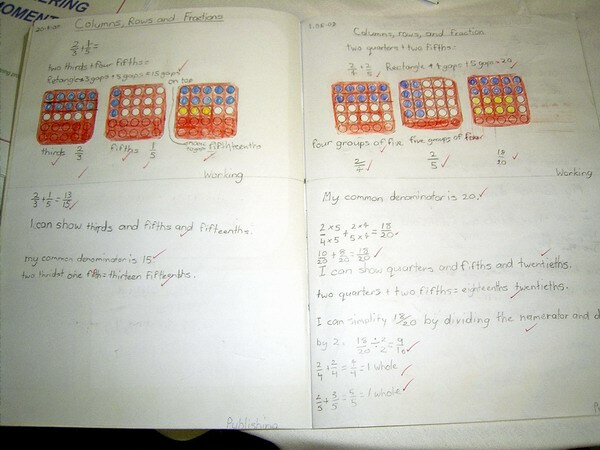 They now enjoy doing maths every day and look forward to the tasks I present to them. (Our curriculum...) has moved away from the textbook oriented lessons and into creativity in maths. Lessons in which I used to struggle to engage students for 30 minutes, now engage them for sometimes up to two hours. Therefore, this idea we have been presented with WORKS! 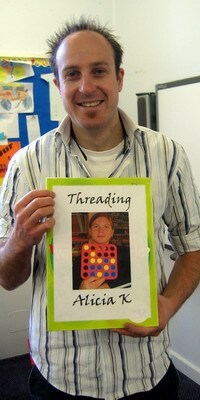 The Threading scrapbooks have been an excellent way of recording the students' work. It is a way for me to check levels of understanding, and for students to refer back when we are threading an activity for a number of weeks. Rather than asking what to do next they have a valuable tool for checking themselves. It has created students who have become more independent and take on more responsibility for their own learning. Also I have been able to use their books as a way of presenting ideas to other teachers. I believe recording is an important component not only for assessing and education department requirements, but for the students as well. Lessons in which I used to struggle to engage students for 30 minutes, now engage them for sometimes up to two hours. During this year I have attended a number of mathematical professional development sessions. Engineering 'aha' Moments in Number (see article linked above) has been the most informative and practical and has shown an improvement in learning outcomes by far. I was at a point where I was not enjoying teaching maths and the students were not enjoying learning about it as well. I was looking at developing different approaches to delivering a more interesting maths program. During this program I have grown in myself and introduced a new methodology that has been successful. When reporting to parents I talk about the student's learning in using this program and how these skills transfer. I use the Threading Book as evidence of what skills I am covering within my units and this is a good evidence based document.